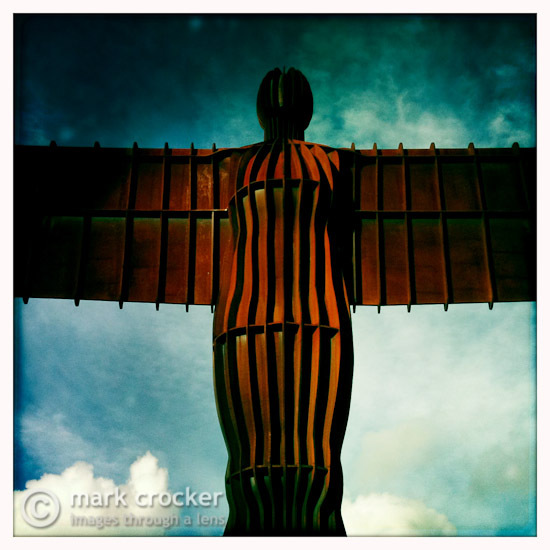 This is a selection of recent images, keeping you up to date with my travels! For most of these posts, you will find a link to more images taken on the day or trip. Enjoy! On my way to Torridon (West Highlands of Scotland) I stopped in Northumberland for the weekend. My main camera is now fixed, but wanted to play with the Hipstamatic application. The angel is not easy to photograph when the lens on the iPhone is not very wide angle. It's been a quiet few months, and mainly because my camera is broken undergoing repair. I have got the old 5D out of retirement and visited Clevedon Pier when some colleagues came to visit. The forecast for the week looked terrible and we were driving back from London when the sun decided to make an appearance. A quick dash to Clevedon Pier and managed to bag some pictures. Took a US colleague down to Clevedon Pier for a evening shoot. Not a great sunset, but came away with a few images. The tide was coming in fast, some of the big rocks on the beach could be used as foreground interest. After a little research, found the location of West Woods, near Marlbourgh. Here is a breathtaking display of bluebells. The woods are part of the forestry commission. Unfortunately my 24-105mm lens decided to pack up on me during the visit. I recently got held up in Munich when "that volcano" blew its top. It was only a few weeks later that I found myself in Iceland staring at the beast. And what a beast. 10 days were spent in Iceland, and Eyjafjallajökull dominated the landscape for much of the trip. 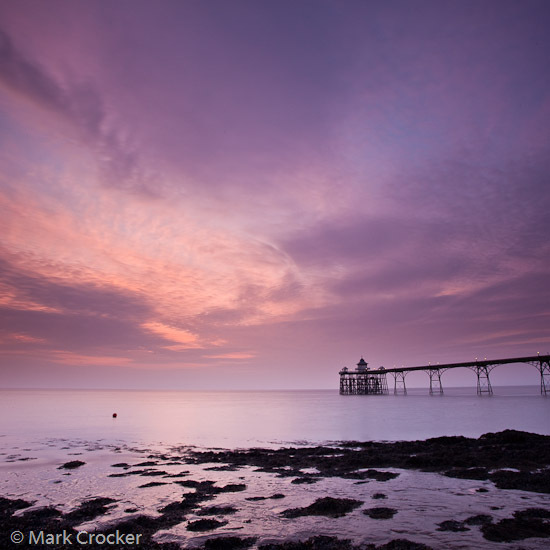 Off down to Clevedon again to grab a stunning sunset - all the better with the volcanic ash - NOT! There was some interest in the sky, but all in all not a great evening. A quick stop off at the Angel of the North. Not sure where these stunning sunsets are meant to be after the Icelandic volcano, but I have yet to see one. 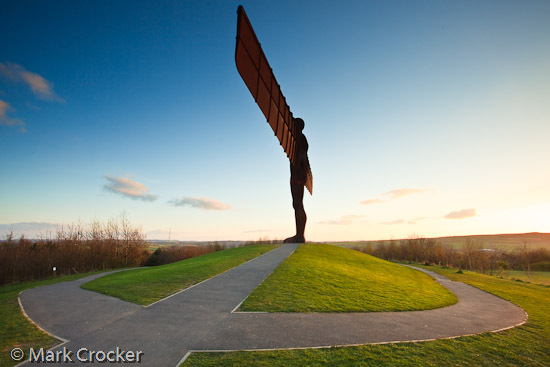 I like the way the path swoops around the angel. I have found it getting messy, with too many trees and bushes to the front to get a clear image. Although it was a warm weekend, reaching 19C on the Saturday, the weather did not play ball, with hazy overcast days. A sunset started to look promising on the Sunday, although another half dozen photographers had the same idea and were spread across the beach. It was time to play with the Big Stopper from Lee. I am really taken with the colour images from the Big Stopper, compared with the very warm colour cast from the B+W filter. I have found I am converting less to black and white. On the beach I bumped into Bristol Bound (see Flikr). I have been following his 10-stop images for some time now. 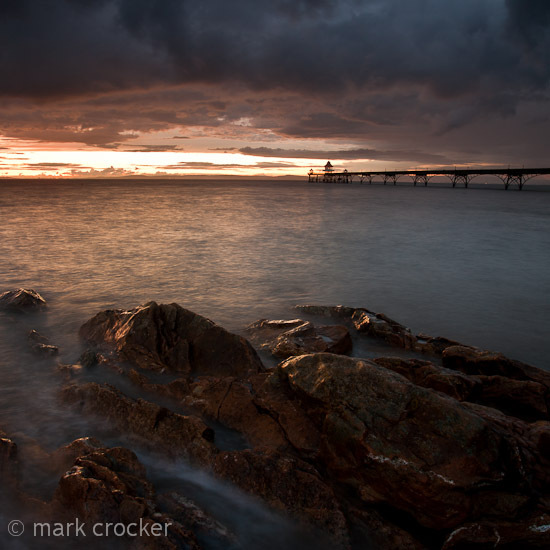 For more images from Clevedon. A long weekend in Northumbria - beaten by the weather. What should have been a photographers dream was unfortunately beaten by poor weather. 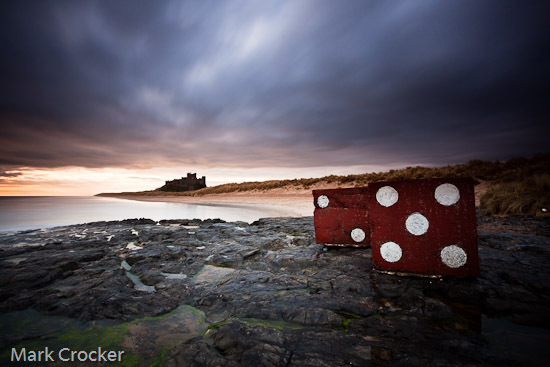 I only managed one morning on Bamburgh beach. I spent the first few minutes in the car staring at a grey sky. It was only when I saw another photographer on the beach that I thought "what the hell!". The sunrise was not brilliant, but a band of light stayed around on the horizon for what seemed liked hours. Then it was off to Amble. I thought the overcast morning would make for some great 10-stop images, but the sun decided to make an appearance and washed it all out. 4 days in Northumbria and 1 morning of shooting! See more. It's been an interesting end to the month. Sharp showers followed by some sunshine. Thought it was time to make my first visit to Clevedon Pier of the year. A fast rising high tide and winds made it an interesting challenge. Too many times my trip was being hit by waves and seaweed. Not ideal when shooting for 30 seconds to 2 minutes. And the sea spray didn't help. There was some fantastic light on the pier when I arrived. I should have left 30 minutes earlier, but in the end bagged some pictures I am happy with. And I still love the BIG Stopper. 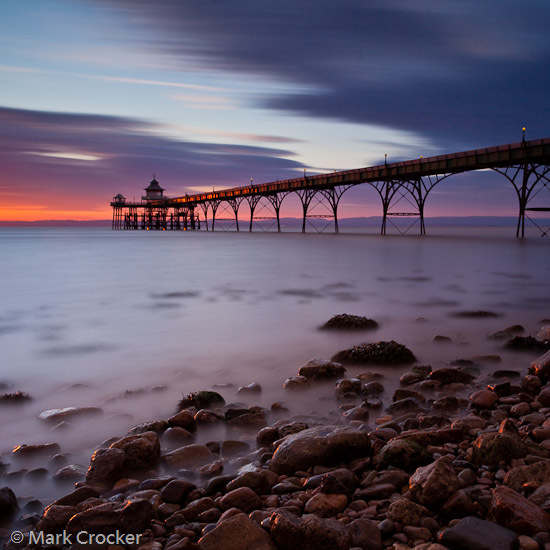 See more of Clevedon Pier. Headed off down to Blacknore Lighthouse in Portishead to shoot some 10-stop. I was expecting a high tide, and when I set out, the sky was grey and uninteresting - great 10-stop conditions. Conditions were a lot of different when I got to the lighthouse. A break in the clouds lit up the rocks on the beach. The tide was lower than I expected and started to recede before the sun had set, leaving the rocks wet. There are some great rock formations to shoot. The sunset came to nothing despite some great clouds earlier on - where did they all vanish to? I came away with pictures I am happy with, but still need to capture a breathtaking sunset. With the lighter evenings, I should have more opportunities. See more of Blacknore Lighthouse. A four day trip to Dorset proved challenging with the rain. First stop, Kimmeridge Bay, was called off due to bad weather. This was followed by a 4.30am start to Lyme Regis - in the fog! I guess it made for some atmospheric pictures. All I can say is thank goodness for the new Lee BIG Stopper 10-stop filter. A great bit of kit, and so much more neutral than the B+W offering. Nearly two days were spent watching the rain fall, before the final day when all was clear. So much to cram in. 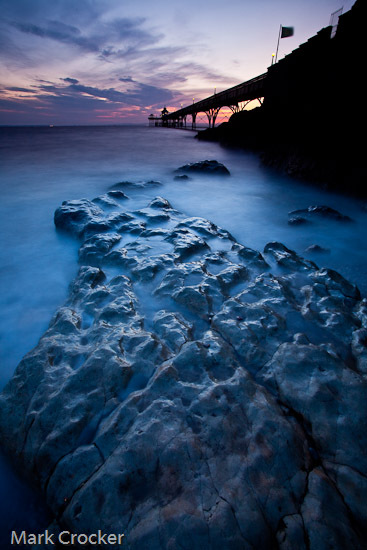 The image above was taken in Swanage, using the Lee BIG STOPPER 10-stop filter. I have generally converted my 10-stop images to black and white, but the Lee filter is fairly neutral so to time to start playing with some colour 10-stop. For more images from my weekend, click here. Last year I was asked to judge a local photographic competition, sponsored by SpecSavers. 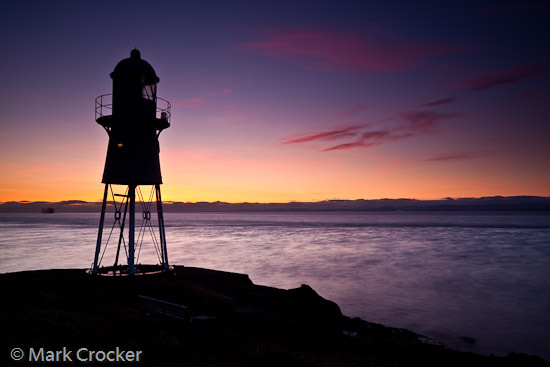 The winning picture I choose was of Blacknore Lighthouse in Portishead taken by Steve Hyde. This was a location I was unaware of and it takes a bit of finding, hidden behind a housing estate. After one recce I took the plunge and headed down to the beach during one bright evening. 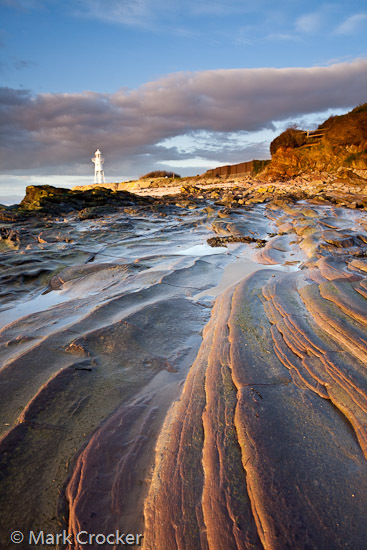 The location holds lots of promise, with interesting rock formations for foreground interest. Once the sun starts setting, you can drop behind the lighthouse and shoot a silhouette. This was also the first time I used the BIG STOPPER - the new 10-stop filter from Lee. What a great bit of kit. It gives a slightly blue cast compared with the very warm cast of the B+W filter. Blacknore is definitely on my list of locations to return to time and time again. Thanks Steve. See more of Black Nore. I was invited down to Dorset for the weekend by a friend of mine. The weather proved to be a bit hit and miss, with a great sunset at Kimmeridge on the Friday night followed by a great sunrise at Lyme Regis on the Saturday morning. Unfortunately Sunday proved to be a bit of washout, but managed to get an hour of shooting at Portland Bill before the rain started. 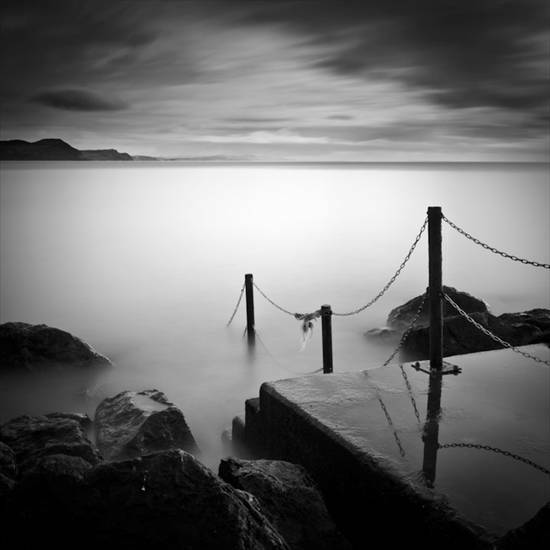 The image above was taken at Lyme Regis. The steps can be found near the museum. This is a long exposure using the B+W 10-stop filter. A grad was used to hold in the sky. I entered this into this years AP 2010 competition and managed to grab an 8th place. Not a winner but it keeps me in the points (but for how long!). See more of Dorset in February. What is the best way to entertain a visiting American colleague? Stand in mud! A colleague and fellow photography was over for business and he had a Sunday afternoon to kill. So we headed off down to Portishead, in North Somerset and stood in mud for a while snapping away. I really must learn to wear more appropriate footwear on these occassions! Despite being an overcast day, we headed off down to marine lake in Weston-super-mare. If all else fails, you can always 10-stop it. Luckily for us, there was a break in the clouds. Unfortunately the lake was not still enough for a reflection. And it was bitterly cold. Better footwear and warmer clothing next time! See more pictures of Portishead and Marine Lake.